Disposable foam ear plugs are soft and comfortable, and come in a variety of colors, sizes, and materials. Foam ear plugs are great for sleep, study, and general noise protection. They are also one of the best all-around choices for industrial hearing protection applications. The corded versions are the same as the uncorded ear plugs, but the cord helps to keep them handy between uses. Here you will find full boxes of corded foam ear plugs. For those who use ear plugs daily, purchasing a box can present significant savings. Boxes of corded ear plugs are also ideal for small businesses and organizations. Looking for Uncorded Foam Ear Plugs? Confused by all the choices? We can help! We have combined top selling products into several different trial packs, each designed to help you find the very best ear plugs for your application. (NRR 29) 3M 1110 UF foam ear plugs (corded version of the 3M 1100 ear plugs) are the stiffest of the poly-urethane foam ear plugs. For those who like the feel of UF, but want the stiffness of PVC (which makes insertion easier), the 3M 1110 is a good choice. (NRR 30) Hearos SoftStar NexGen foam ear plugs provide the smooth roll-down of a cylindrical (barrel) design, with the softness of PVC-free UF foam. Star indicates proper method of insertion. Smooth skin for reduced irritation. Corded. Box of 100 pairs. (NRR 33) Hearos Supreme Protection Series foam earplugs are made of FutureFoam™, a proprietary PVC-free UF foam material that provides a silky smooth fit for all day comfort and excellent protection from noise suitable for the most demanding environments. (NRR 32) Radians Resistors™ 32 UF foam ear plugs feature an extra long tapered shape and smooth skin for a long duration comfortable fit for most users. (NRR 32) Radians Detour™ UF foam ear plugs feature a bullet shape with easy grab wings, sized to fit most adults, a high visibility color, and a very soft, low pressure design that offers a comfortable fit for all day or all night wear. (NRR 33) Radians Deflector™ UF foam ear plugs corded feature a bullet shape sized to fit most adults, a high visibility color, and a very soft, low pressure design that offers a comfortable fit for all day or all night wear. (NRR 32) Elvex Blue™ UF foam ear plugs feature a slow expansion, low pressure, polyurethane foam that helps users get a proper deep-in-the canal fit, and provides for all day comfort. (NRR 32) Elvex Uni-Fit™ UF foam ear plugs corded feature a slow expansion, low pressure, polyurethane foam that helps users get a proper deep-in-the canal fit, and provides for all day comfort. (NRR 29) Radians Resistors™ 29 PVC foam ear plugs feature a cylindrical shape that provides a comfortable fit for most users. (NRR 29) DeWalt PVC foam ear plugs are an economical choice for general noise protection applications. (NRR 33) Radians Deviator™ UF foam ear plugs corded feature a bell shape sized to fit most average to larger adults, a high visibility color, and a very soft, low pressure design that offers a comfortable fit for all day or all night wear. (NRR 32) LaserLite corded ear plugs have snappy colors, an average to large fit and excellent rating making these a good all-around choice. (NRR 30) Good NRR rating and super soft in a small to average size makes Howard Leight by Honeywell MaxLite UF Foam Ear Plugs a great option for smaller folks. (NRR 32) Howard Leight X-Treme Ear Plugs are a highly economical hearing protection ear plug with very good noise blocking and a bright orange color to assist with compliance. Suitable for a wide variety of noisy applications. Corded for convenience. Box of 100 pairs. (NRR 33) Hearos Supreme Protection Series foam earplugs are made of FutureFoam™, a proprietary PVC-free UF foam material that provides a silky smooth fit for all day comfort and excellent protection from noise suitable for the most demanding environments. Large size, corded ear plugs. Box of 100 Pairs. Box of 100 Pairs,each pair packed in a biodegradable, non-static paper bag. (NRR 30) This package is a full box containing 100 pairs of Howard Leight by Honeywell MaxLite Ear Plugs with poly cords in Bio-degradable, Non-Static Paper Bags. (NRR 30) Designed based on the input of actual workers who use prefer foam ear plugs and who use hearing protection on a daily basis. FirmFit is firmer than most Howard Leight by Honeywell foam plugs, but softer than other classic cylindrical-style ear plugs. Box of 100 corded pairs. (NRR 30) Howard Leight by Honeywell MAX SMALL UF foam ear plugs are made to fit like the full sized MAX UF foam ear plugs, but 20% smaller to fit better in small ear canals. (NRR 33) An excellent noise reduction rating, average to large size fit and the comfort of UF Foam makes Max a favorite industrial plug for high noise environments. Box of 100 Pairs. (NRR 33) A high NRR, average to large size fit and the comfort of UF Foam make Max a favorite industrial plug for high noise environments. Box of 100 Pairs, each individually packed in biodegradable, non-static paper bags. (NRR 30) Moldex Mellows® foam ear plugs are made of super soft, lightweight, 100% PVC-free foam in a popular bell shape. This tried-and-true tapered design ensures a comfortable fit, with little to no irritating pressure on the sensitive ear canal. Box of 100 corded pairs. (NRR 33) Moldex Softies® UF foam ear plugs are made of extra-soft, extra light foam. Their tapered shape fits easily in the ear canal and seals gently without pressure. Softies are one of our top picks for sleeping! (NRR 33) Howard Leight by Honeywell Max USA UF foam ear plugs offer the same great qualities as do regular Howard Leight by Honeywell Max ear plugs, but these come in patriotic red, white, and blue. (NRR 33) SparkPlugs® UF Foam ear plugs are an officially licensed ear plug of NASCAR. Random colors for a little fun, and their great performance and average to large fit means no compromise. Excellent all-around choice. (NRR 33) Different camouflage colors in every package. Serious protection for serious users. Tapered shape for easy fitting and removal. (NRR 33) Moldex Goin' Green® UF foam ear plugs are extra-soft low pressure foam and tapered fit for extended comfort. Box of 100 Pairs. (NRR 33) Pura-Fit® is designed for increased compliance and fewer complaints. The special foam is formulated for softness and comfort, and the outer surface is smooth, so it doesn't irritate the ear canal. (NRR 32) Peltor Next Tattoo UF foam ear plugs offer a slick barbed wire graphic, a neon green color and a noise jamming NRR of 32, for great protection with a great look. (NRR 33) Moldex Meteors UF foam ear plugs feature an undercut design that helps these top quality ear plugs stay in your ears better. (NRR 30) This package is a full box containing 100 pairs of MaxLite® UF foam ear plugs with non-static cotton cords, individually packed in biodegradable, non-static paper bags. (NRR 28) Moldex Meteors® UF foam ear plugs now come in a small size to fit smaller ear canals. The same exceptional comfort that comes from the unique curved design of Meteors® is now available for everyone with smaller ear canals. Box of 100 Pairs. (NRR 33) E-A-R EarSoft Yellow Neons UF foam ear plugs are a very soft and comfortable high-performance earplug for high noise situations. (NRR 33) E-A-R EarSoft FX UF foam ear plugs feature a patented shape that helps these very soft earplugs fit a wide range of users, with an excellent noise rating of NRR 33, and comfort for extended wear. (NRR 33) E-A-Rsoft SuperFit UF Foam Earplugs Corded offer a unique combination of features: soft, slow-recovery foam for all-day comfort, an excellent NRR, plus a unique high visibility fitting ring that instantly identifies whether the plug is properly inserted or not. (NRR 33) E-A-R EarSoft Yellow Neons UF foam ear plugs feature a very soft, smooth, gently tapered shape to provide one of the most comfortable disposable foam earplugs available. These foam earplugs are corded, with an easy-to-see blue cord and neon yellow earplugs. Box of 200 pairs. (NRR 32) E-A-R Taperfit 2 UF foam ear plugs are made of self-adjusting, dermatologically safe foam and with a tapered shape, the Taperfit 2 from E-A-R provides an excellent NRR of 32dB in an extra-comfortable, low-pressure design. (NRR 33) E-A-R Soft Blast UF Foam Ear Plugs are a nice simple UF foam plug with a racy orange flame design. High NRR rating, good average fit. (NRR 29) The tried and true standard in industrial foam ear plugs. E-A-R Classic PVC foam ear plugs are easier to insert because they are stiffer, then they soften from body heat for long term comfort. Avg. Size Only. (NRR 33) E-A-R Classic SuperFit gives you the benefits of easy insertion like the Classic, but with the higher rating formerly only available in UF foam plugs. The patented visual indicator tells you when the plugs are properly inserted. (NRR 28) E-A-R E-Z-Fit are ultra-soft, a little shorter than most other foam earplugs, but with a nice flared back end that lets these plugs fit an unusually wide range of ear canals from small to large. 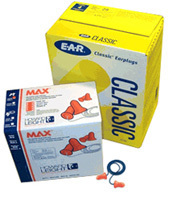 (NRR 31) E-A-R Classic Soft ear plugs are made of a patented foam that is firm at room temperature for ideal insertion. Plugs then soften with body heat for a surprisingly comfortable fit. (NRR 31) E-A-R Soft Grippers UF foam ear plugs offer an excellent solution for those with average to large ear canals, who need to wear earplugs for extended periods. These super soft ear plugs are some of the most comfortable you can buy. Available in corded only.